It appears that Ndamukong Suh's meeting last month with NFL Commissioner Roger Goodell didn't do any good. Suh — whose full name is pronounced "En-dom-ah-ken Soo"— initiated the sitdown in response to his growing reputation as a dirty player. The second-year defensive tackle for the Detroit Lions wanted league officials to give him a better idea of what he's doing wrong, having been fined three times for rough hits on quarterbacks since last season. At the time, he had drawn three personal foul penalties in eight games this year. Now, after the Lions' annual Thanksgiving Day game, the tally is four personal fouls through 11 games. Perhaps "stomping on an opponent" was never mentioned in discussions. They can bring it up next time (likely very soon), because that's what Suh did in Detroit's 27-14 loss against Green Bay. Suh was penalized and ejected after the altercation, in which replays show him repeatedly pushing Green Bay lineman Evan Dietrich-Smith's head to the ground and then kicking him. "My intentions were not to kick anybody, as I did not," Suh told reporters afterward. "[I was] removing myself — as you see, I'm walking away from the situation." That's his story and he's sticking to it, regardless of how intentional the action seemed. "I understand in this world because of the type of player and type of person I am, all eyes are on me," he said. "So why would I do something to jeopardize myself, jeopardize my team, first and foremost?" Because in the heat of competition, he loses self-control? That's the only logical explanation, and it appears to be the right answer, too. The incident brought to mind an act by then-Tennessee Titans defensive tackle Albert Haynesworth in 2006. He stomped on the face of helmetless Dallas Cowboys center Andre Gurode, who required 30 stitches afterward. Not everyone believes that Suh should be punished as harshly as Haynesworth, who received a five-game suspension without pay. But most commentators said that Suh's track record is a factor and he merits at least a one-game suspension, if not multiple games. An NFL spokesman said the play won't be reviewed until next week. 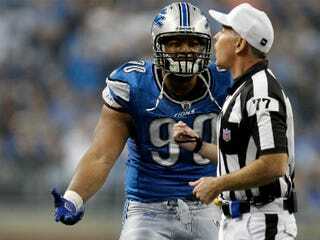 The league might as well hit Suh hard and hope that does the trick. Because it's doubtful that another meeting would help more than the first one.